After a cold night at the campsite in Malham, we were a bit sluggish at getting going this morning and so it was well after 9am before we were walking. We picked up the broad path towards Malham Cove, which was relatively quiet at this time of the morning on a snowy Easter Monday. The steep path to the west of the cove brought us up to the impressive limestone pavement above, with excellent views back down the valley. The thin layer of snow over the limestone pavement meant for slow progress as we took it carefully to avoid slipping! Eventually we reached the path through the dry valley of Watlowes, which was quite pretty in the snow today. It was now apparent that due to the time, we would struggle to finish our planned walk to Horton-in-Ribblesdale in the light. There was also the important matter of arriving in time to catch a train home! Therefore we opted to strike west across the moorland towards Settle, with the aim of catching a train home from there instead. 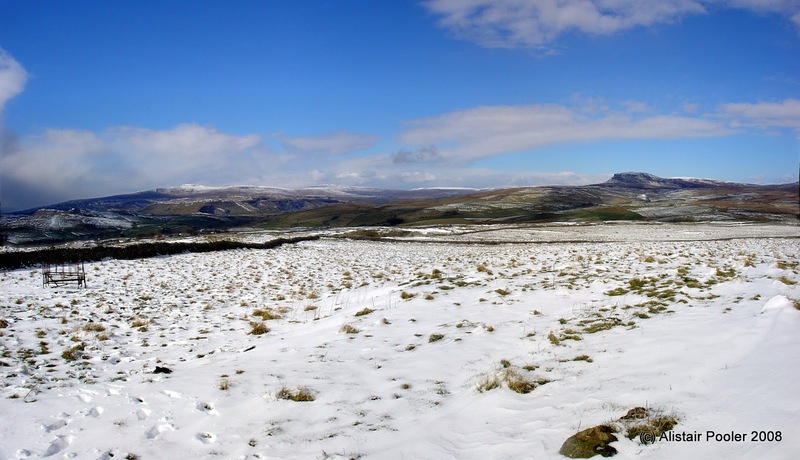 We followed a reasonable track westwards over the snow covered moors. By now there was much blue sky about, which resulted in excellent views across to the Yorkshire 3 Peaks of Ingleborough, Whernside and Pen-y-Ghent in the distance across the moorland. The path eventually brought us to the minor road above Langcliffe, from where we picked up an extremely muddy bridleway down into Settle itself, where we arrived in the mid-afternoon. As we had a bit of time to kill before the next train, we popped into one of the many cafes to relax after an excellent four days of walking.